Diogo Paiva – ESR11: Researching GIS systems of Historical Addresses. For over half a century, population historians have created datasets based on archival sources such as parish records, tax records, censuses and population registers. Their time span ranges from mediaeval times to the present day. These kinds of sources deliver data on an individual level such as the date and place of birth, occupation, religion, household composition etc. A characteristic of all nominal lists, census records and population registers is that the individual or household are situated in geographical space with some kind of address. These addresses may be very vague, such as ‘between the church and the small canal’ but also quite precise, like ‘D22a’, indicating quarter ‘D’ and number ‘22’ with the addition ‘a’. Another problem with addresses is that they are of an ambiguous character. This means that they change during the ages while still referring to the same geographical space. This may be a result of renumbering or the introduction of another address systems like street names replacing letters of quarters. The best way to tackle the problems outlined above is to geo-reference each address to a point on the map in a very detailed way in combination with a time stamp to distinguish each address, using old maps, concordance tables or indications of geographical sequence (like walking routes of taxmen or of postmen). But this is a highly time-consuming and often manual procedure. A less precise method is to allocate each address to a specific part of a locality (like quarters in a city or hamlets in a municipality). A further alternative is to apply a modern postal code to a place in the past or make a new historical ‘postal code’ of small geographical spaces that are more detailed then the quarter in a city and in which addresses are probably easier to pinpoint. The first goal of the project is to make a comparative inventory of how addresses have been assigned in the past. This implies a critical overview of how historical databases manage the problem of addresses. Delivering an overview of GIS implementations of addresses and providing a list of best practices in historical databases. A next step is to build algorithms to implement a GIS based address system for at least two databases that are the most suited to start with. The study may be further developed into a Ph D Research design, to be decided in the beginning of the second year. 11.1 A comparative inventory of how addresses have been assigned in the past. 11.2 A critical overview of how historical databases manage the problem of addresses. 11.3 An overview of GIS implementations of addresses and providing a list of best practices. suited to start with, result: adding variables with GIS coordinates. 11.5 A PhD Research design, personal development plan (course followed at NW Posthumus Institute). 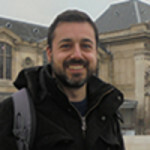 Diogo Paiva, born in Lisbon, graduated in Archaeology at the Universidade NOVA de Lisboa, in 2005. The next years were divided between archaeological fieldwork and teaching activities in adult courses. In April 2011, a new opportunity took him back to the Universidade NOVA de Lisboa to work at the Portuguese Center for Global History (CHAM) for a project related to Middle Assyrian History. In the following year he obtained a MA in History (esp. Ancient Near Eastern Civilizations), under the supervision of Professor Francisco Caramelo. In the past five years, he has been a research assistant at CHAM working in several research projects, mainly focused in Assyriology, Reception of Antiquity and Historical Demography, always combining these different fields with the interest on Digital Humanities. In 2016, he was selected to be one of the 15 LONGPOP European project Early Stage Researchers (funded by European Union H2020, under a Marie Sklodowska-Curie grant), working under the supervision of Kees Mandemakers at the IISH (International Institute of Social History). His current activities are geocoding historical addresses of the Historical Sample of the Netherlands and record linkage between different historical population databases.